Conrad Martens Plumbing & Hot Water are Brisbane’s local and trusted maintenance plumbing specialists. 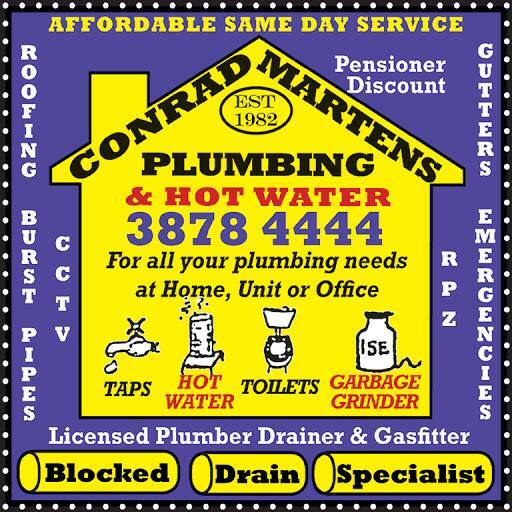 We pride ourselves on delivering a first class service at an affordable price.Conrad Martens Plumbing & Hot Water has been servicing the greater Brisbane area since 1982. Our experience, dependability and quality of workmanship are the foundation on which our company’s large referral base has been built. We provide an emergency service and specialise in all aspects of plumbing and hot water maintenance and installations. With over 35 years experience as a trusted Brisbane Plumber we deliver top quality service & excellent workmanship at an affordable price. A A A Warren Elliot ..